The outgoing head of the EU’s law enforcement body has said he is “quite positive” the UK and EU will reach a new post-Brexit deal on security. But Europol’s Rob Wainwright said “with the clock ticking down, we still have a lot to do”. Meanwhile, South Wales Police and Crime Commissioner Alun Michael said Brexit poses “serious threats” to his officers’ ability to deal with crime. Theresa May has called for a “special partnership” on security after Brexit. Speaking at the Munich Security Conference in February, the prime minister said the new arrangement should be effective by 2019. EU negotiators have been given guidelines to secure “strong EU-UK cooperation in the fields of foreign, security and defence policy” as part of the Brexit negotiations about the future relationship. Founded in 1999, Europol, employs more than 1,000 people at a cost of £100m a year, but the UK will cease to be a member after its departure from the EU. Mr Wainwright, from Pontyberem in Carmarthenshire, said the organisation “benefits from the UK’s very pro-active engagement in Europol”. He added: “Naturally as director of Europol, and I’m sure the non-British person who’s going to replace me… I’m sure she will say the same – that any member state frankly, but certainly a leading one who’s contributing so much to Europol – is worth hanging on to. Mr Wainwright, who was an MI5 agent before moving to Europol, said the nature of modern security threats meant it was “important that we get the best cross border co-operation deal”, which will be “different to what we have now, but it’s got to be a close partnership”. Mrs May has warned “rigid institutional restrictions or deep-seated ideology” should not jeopardise the security of UK citizens. But Mr Wainwright said the rulebook “is there for a purpose to guarantee legal consistency”. He added: “That said, there is always the need for flexibility to ensure that we continue to refine the way that we manage what is a very dynamic threat situation in Europe. “In the EU we are introducing new legislation each year, quite frankly to deal with new capabilities in criminal and terrorist capabilities. Key European security initiatives include the Schengen Information System of real-time alerts about suspects and the European Arrest Warrant (EAW) under which suspects can be speedily extradited between member states. Between 2010 and 2016, Welsh police forces surrendered 151 suspects to EU member states and 25 suspects were arrested and sent in the other direction. The prime minister has said it would damage both the UK and the EU if Britain was outside the EAW “and would put all our citizens at greater risk”. Mr Michael said “there will be a will to maintain the EAW” after Brexit. But the Labour politician and Remain supporter said: “I believe that our job will be made more difficult by the fact that in future we’ll be negotiating with Europe as well as doing bilateral negotiations on communications, sharing of data, sharing of intelligence, things like that and we won’t be in the room. “The important thing is we need to maintain, as far as possible, the continuity of the things that we have built up over the years – sharing of intelligence, sharing of data, the EAW, having standard of law and criminal justice across Europe and if we’re excluded from the mechanisms of the future, that will be bad for justice in Britain. 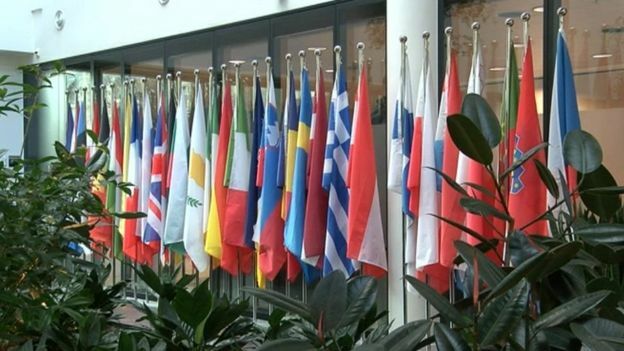 At Europol, the UK leads teams on issues such as human trafficking and cybercrime. “South Wales is a bit of a hub for cyber security for the whole of the UK,” said John Davies, co-founder of the South Wales Cyber Security Cluster. Asked about the potential affect of Brexit, Mr Davies said: “There are no boundaries for the cyber threats. You can have a hacker sitting by a desk or laptop in Bulgaria hacking organisations in Blaengarw. “That effort that we all have to make to collaborate is going to be rising above any political infrastructure. On cyber-security, Mr Wainwright added: “Wales plays a part as part of a strong UK commitment in cyber security and other areas as well. We are very pleased to have that association.